"If Netanyahu goes for a bold diplomatic move I'll be there to help him," says new Labor chairman. 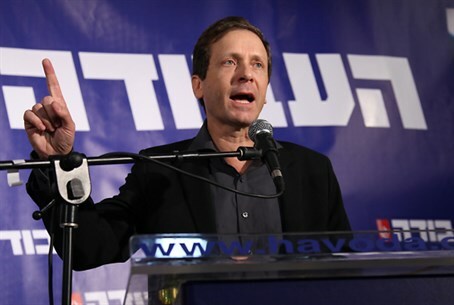 The new chairman of the Labor party, MK Yitzchak Herzog, said on Saturday evening that he was “in no rush” to join Prime Minister Binyamin Netanyahu’s coalition. "If Netanyahu goes for a bold diplomatic move [vis a vis the peace talks] - I'll be there to help him, either from the government or outside the government," Herzog told Channel 10 News. MK Herzog said he had a pleasant conversation with Netanyahu, who congratulated him on his victory. "I told the Prime Minister I would be happy to meet him at any time. I do not make a big deal out of these meetings. I respect the Prime Minister and I will meet him. He himself knows he should not sleep with one eye open in anticipation of me joining his coalition tomorrow." Herzog said he received a call from Palestinian Authority Chairman Mahmoud Abbas and indicated that he intends to meet with him. “It's no secret that I think the people of Israel, even though some like to repress it, must understand - and I do not say this out of a love for the Palestinians or a desire to give up parts of the country - that we must separate ourselves from the Palestinians,” he stated. Meanwhile on Saturday, MK Shelly Yechimovich who lost out to Herzog in the race for the Labor leadership, indicated that she would support Herzog and not leave the party. "We live, breathe and work within a democratic party and therefore we respect the results of the democratic elections and are now joining forces for joint cooperation with the elected chairman," she said at a meeting with activists. "I swore that I would not do to the elected chairman what was done to me when I was elected," she added, referring to opposition to her leadership from within the party, particularly from Amir Peretz, who subsequently defected from Labor to join Hatnua. Despite the bitter failure, she said she accepts the decision of the voters. "Not only am I not even thinking about leaving the party, in fact we should be more involved and more dominant. It’s time to strengthen the party. I'm going to completely stand beside the person who was elected and give him all the support possible."